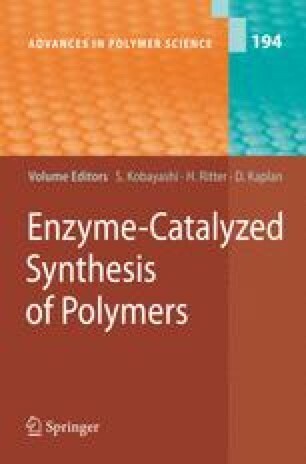 In vitro synthesis of polyesters by polycondensation using isolated enzymes as catalyst via nonbiosynthetic pathways is reviewed. In most cases, lipase was used as catalyst and the polyesters were obtained from oxyacids, their esters, and dicarboxylic acid derivatives/glycols. Enzymatic polymerization proceeded under mild reaction conditions in comparison with chemical processes. By utilizing characteristic properties of lipases, regio- and enantioselective polymerizations proceeded to give functional polymers, most of which are difficult to synthesize by conventional methodologies.